These are some nice looking maps. The sizes of the maps are pretty good. They're not too small, yet not too big and look pretty easy to navigate without getting lost. Either way, I like these maps and the tiles you chose for them! If the shadows don't show in game, don't spend the time removing them. I learned long ago to leave stuff like that be because those few extra minutes add up quick, and that time can be far better spent procrastinating . Good looking maps! My personal preference is to have doors on the buildings. Makes them look more complete. 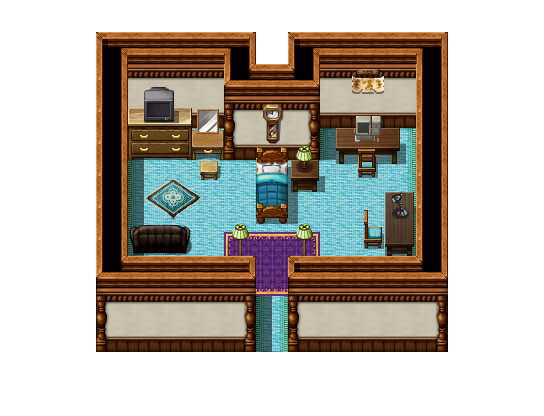 The bedroom is a little cramped visually, but there's plenty of space for the character. I'm assuming the tops of the lamps at the bottom have * passability. Being able to walk behind stuff adds a lot more depth to maps. I have more than a few maze like areas and puzzles that take full advantage of it. Huh. Those are some really neat maps. Hell, they look like they were made within the editor (I guess one could do that anyway and then just use a script to take a picture of the map - did this to make map images for Galv's Map Screen Script for a game project I've since shelved). I kinda want to try my hand at this kind of mapping at some point, though I'm unsure of how it works. 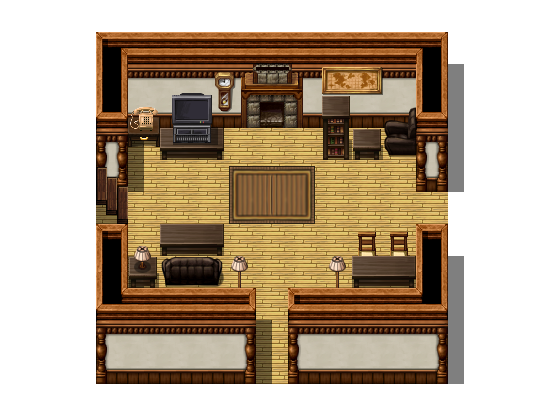 I also will be doing parallax mapping at some point, but right now I'm not sure how it's done. There are tutorials, but it looks like a lot of work. Probably won't get to doing this until my game demo is complete. There are some great tutorials to use, and it *is* a lot of work, but it's totally worth it IMO. It took me three years to learn how to do it, though Best of luck to you! Hey-oh! I love the look of them and the lay-out of the maps! Coming from a Parallaxing standing-point and what all you can do with it, there's a lot you can do to set a scene. A lot of it actually comes from lighting and understanding color combinations and why things look good together and why they don't. In lighting, there's objects in your scene that you can use to portray a mood or setting. Finding ways to draw the players eyes to things can really highlight what you want the player to interact with. 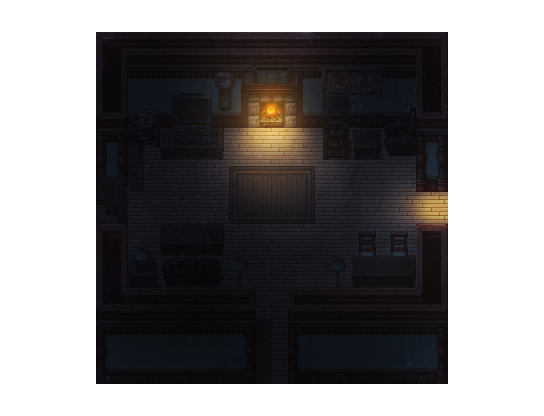 It can also be used to show the player where you want them to go, such as lighting up the next room's doorway as a way of saying, "Go this way!". Now on to color theory and color combinations, in general you should always be looking for ways to find and incorporate complimentary colors, or compound colors. These involve colors that basically cancel each other out, or otherwise known as "opposite colors" they create sort of the largest contrast and on the color spectrum are "opposite" each other. This goes hand-in-hand in also setting a mood with just colors alone. For instance finding "warm" and "cold" colors can instantly change what the scene is about. I've made two quick examples sort of showing what I mean. With this image here, what I've done is find my lighting source, which is the TV. 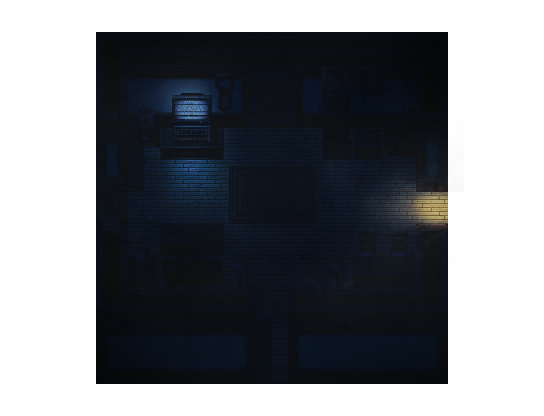 Using a dark blue overlay to show a creepy or darker setting, and then incorporated a game element of lighting up the next room over to show that the player should go here next. I then put static on the TV and added tiny spec's of white around the image for dust. Going back to complimentary colors, Blue and Orange, from the lighting of the next room and blue from the TV create a great contrast which you can see in a lot of games like Chrono Trigger. For the second image, I changed my lighting source to the fireplace and made it much more brighter. Then setting a warm orange overlay has changed the mood of the scene to something less chilling or unsettling. For what I recommend, I'd use "Adobe's Color Wheel" to find your complimentary colors if you're unsure of what works together and doesn't. (But, don't let this be the end all-be all for everything you do, always use what you personally think looks nice). Edited November 10, 2017 by Izu. 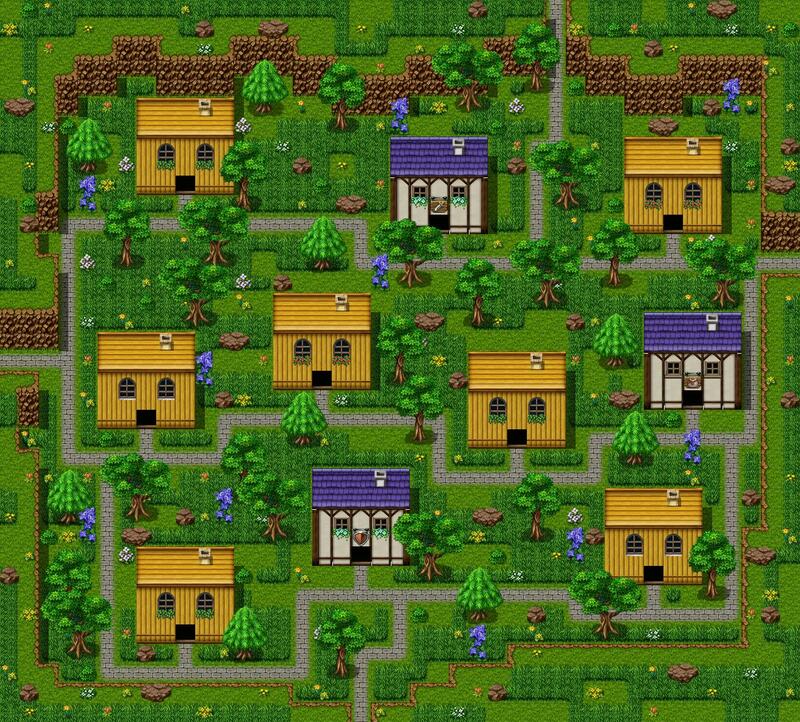 I like your work here, the open town map looks very busy, but when you are working closer with it, you will likely not notice how many trees there are. One thing I did notice, and this is more of a design point really, is the level of technology from the outside of the town to the inside. Seems odd to me that a town with a big screen TV in the room would not have a single street light or any sort of cars or traffic to speak of, but maybe that is just me. Sadly with the tilesets I have to work with that's not an option. I'll elaborate more later.